In the first three months of the year, even the tiniest flowers mean a lot. Sure, it's easy to wax rhapsodic about a plant's gorgeous leaves when the sun is shining and it's above 70 degrees. But on four-layer days when you're looking for your down vest, it's flowers that are called for. I'm glad I took cuttings of my Pelargoniums last November. And ordered a few more this year. And I'm really glad I kept my Lachenalia happy throughout the summer when it required warmth and dryness. Lachenalia are easy to grow once you get the hang of it. Plant the bulbs and forget about them until they start to grow. I discovered they make great cut flowers, too. They last in a small vase for more than two weeks! And I found that Pelargonium leaves make good "collars" for encircling the flower stems. 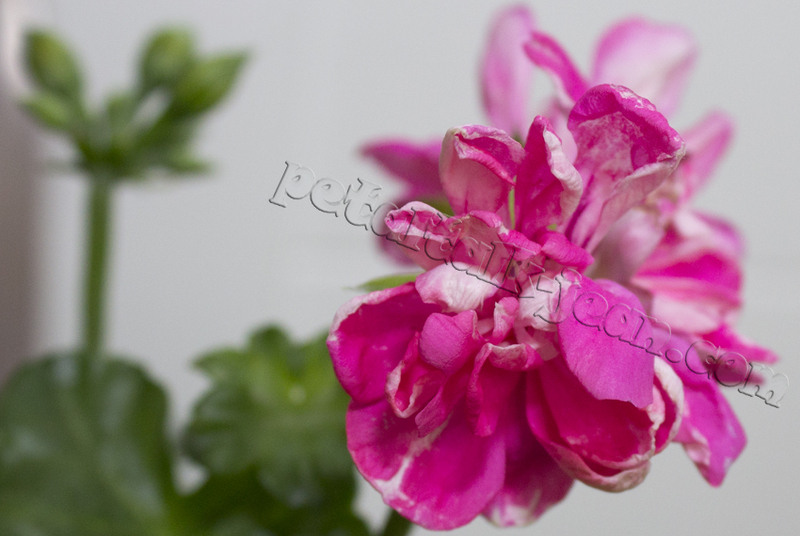 Pelargonium ‘Cerise Carnation’ is an ivy geranium hybridized in the U.S. in 1955. 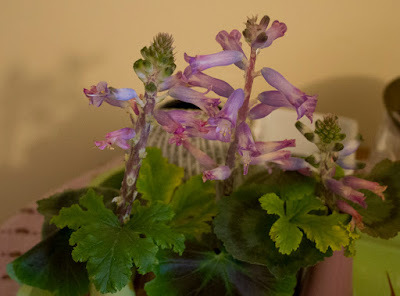 As for the pellies, I can't say they're blooming their little heads off, but many of them are pushing out buds and opening up to bring me joy in a colorful package. One of my theories about their ability to bloom without too much trouble is that they don't require a lot of humidity. If you've ever tried to grow things like Gardenias or even fuchsia indoors, you've suffered the frustration of watching a bud form over a period of weeks, plumping up to a promise, and finally, dropping off like a run-on sentence. 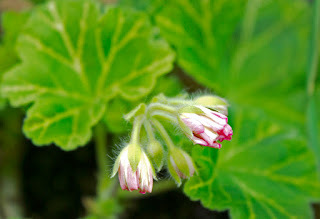 Pelargonium 'Mosaic Silky' in bud. If light is scarce, get some lights. Plants that bloom indoors in the dark of winter are scarce. If you have a sunny window--I mean a window that consistently lets sun in--you might just have success. My lights are set up above tables that are just inside a bank of south-facing windows. I could have put the lights anywhere, but I figured I might as well take advantage of the natural light. I won't say no to the flowers of Pelargonium 'Mosaic Silky'. Natural light - the kind that comes through the window - signals the plants it's time to wake up and grow. In case you hadn't noticed, the days are getting longer. The plants notice and are perking up like dogs with a new toy. They're drying out more quickly, partly because their pots are filled with more roots than they had when I first planted them. I purchased Pelargonium 'Mosaic Silky' from geraniaceae.com in late November. The leaves on this zonal type are certainly enough to make this plant worth growing. But the flowers are nothing to sneeze at, with their ruffled party dress pink blooms popping open from stems that reach just above the leaves. 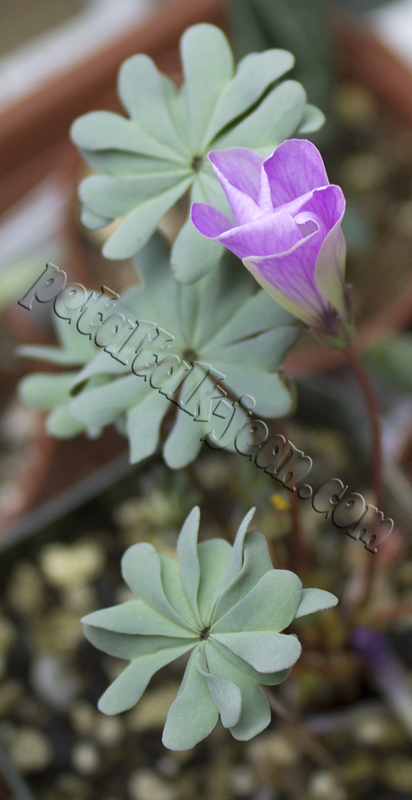 One plant I've come to love enough not to be without is Oxalis adenophylla, AKA silver shamrock. 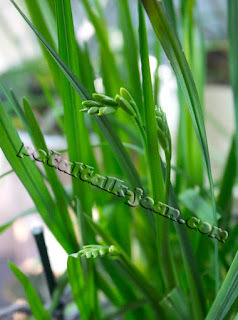 It's grown from a tiny bulb that takes its sweet time emerging. I planted them as soon as I got them--late November. They take nearly three months before you can see anything, and then they slooowwwlllyyy grow up to about four inches tall--leaves and flowers at the same time. It doesn't seem to matter where you put them or whether you keep them dry or toss a little water on them when you think about it. It just takes that long. It's easier to anticipate blooms when you see the buds. In the case of Freesia, which I planted in late November, I'm finally seeing flower buds appearing as if between the leaf stalks. These are tricky to water, especially if you grow them in a plastic pot, leaving less margin for error. They prefer it dry and cool; in their native southern Africa they bloom in winter in sandy locations. The one that is the most vigorous is the species F. alba, described in Cape Bulbs by Richard L. Doutt as having the most primitive form and the most fragrant flower. I hope to post photos soon. When our plants begin to pooch out those little buds and the sight of color beginning to ooze out of those little buds do make the heart swell. It won't be long until we will be swimming in blooms. Can't wait.